Welcome to Girl Walks Into a Bar, a weekly Gut Check feature that spotlights local bars and bartenders. This week, Stacy Anderson profiles Cleveland-Heath's Elijah Barnes. 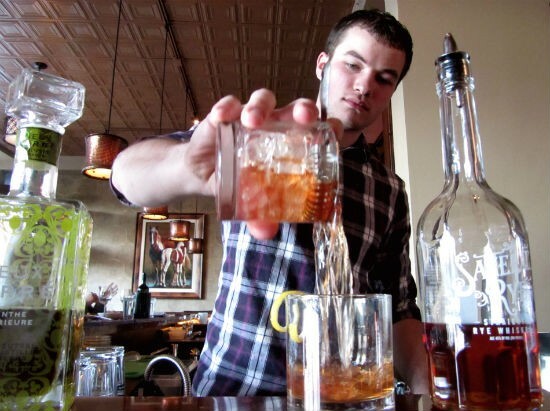 Below is a Q&A with Barnes, followed by his recipe for the Sazerac Cocktail. Cleveland-Heath (106 North Main Street, Edwardsville, Illinois; 618-307-4830) is fairly new to the restaurant scene, but you wouldn't know it by watching the experienced and knowledgeable bartenders and waitstaff. One bartender in particular, Elijah Barnes, mixes drinks with the ease and finesse of someone who's made this business his passion, a sentiment that comes through in every glass he slides across the bar. Barnes has been mixing food in the kitchen since he was a child and says that naturally translates to cocktails behind the bar. "I'm good at conceptualizing drinks in my mind," says Barnes. "If someone asks me to make a drink with a new product, I look behind the bar and can usually come up with something good." Since Cleveland-Heath opened its doors last November, Barnes has been behind that bar almost every night and now oversees inventory and menu creativity. 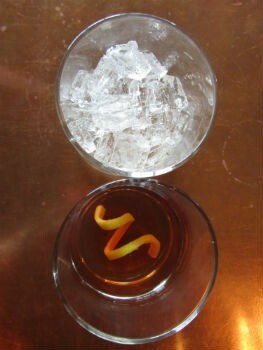 The "Sazerac Cocktail" is a recent edition to the cocktail menu and a personal favorite of Barnes. The drink nods to old New Orleans by combining Sazerac rye, absinthe (Barnes uses Vieux Carré), aromatic bitters, simple syrup and a lemon twist, creating a mixture that will knock you off your toes with the first sniff, yet bring you back to life with the first sip. Barnes describes the debut of the "Sazerac Cocktail" by telling a story about the week Cleveland-Heath added the drink to its menu. "A man came in and sat at the bar. 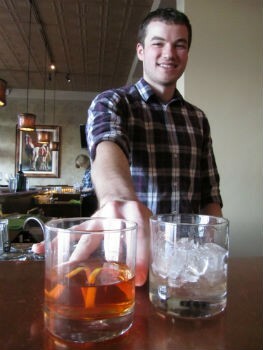 He said he was taught to make the 'Sazerac Cocktail' by a man in his eighties in a bow tie, straight from New Orleans. He then taught me the right way to make this drink." Describe your bartending style in three words... Particular. Goofy (if I see you do a moonwalk behind the bar, I'm in the right place) and respectful (with both the guests and the drinks). A girl walks into a bar and orders a ________. She has just earned your undying admiration. A gin martini, up, because no one drinks gin martinis anymore. Other than your own place, where do you go to get a good drink and what do you get? Wine Tap (223 East Main Street, Belleville, Illinois; 618-239-9463) in Belleville. [I] would order the house Manhattan. What's one thing most people don't realize about crafting cocktails? How much a drop of any liquid can change a drink. Most people have drawn away from the subtleties. They want a smack in the face when they drink. It's the subtleties. Who would you most like to have a drink with? An old friend. What is the most bizarre/stupidest/dumbass drink anyone has ordered from you? From me? A bottle of Bud Light. What's the coolest/weirdest thing you've witnessed while working? A regular customer took my picture with her phone because she liked me as a bartender so much, then made it the background on her phone. She's a regular, so maybe she'll see this. The Sazerac Cocktail Line two rocks glasses with absinthe. Fill one with ice and add all ingredients to iced glass and let chill. Strain mixture into other glass and garnish with a lemon twist. Garnish with a lemon twist and serve with two glasses: one for the cocktail and one with the ice used to mix the drink, to give the customer a choice.